Springfield was settled when Elias and Mary Briggs and their family arrived in 1848. They were among the first party to travel to the region via the “Southern Route” by Klamath Lake, over the Cascades, into the Rogue Valley, then north to the Willamette Valley. Elias Briggs chose for his home a place convenient to a spring of water and in due time this land was fenced in. This enclosure became known as the “springfield” — hence the name of the town. The Briggs family operated a ferry across the Willamette River at roughly the site now occupied by the Union Pacific railroad bridge. In 1852, Mr. Briggs began building a town. He dug and built the mill race and he and Mr. Driggs of Linn County formed the Briggs and Driggs Company and began to build a flour mill and a saw mill in 1853 and 1854 respectively. Springfield was platted in 1856, incorporated as a city February 25, 1885, and received its charter March 17, 1893. In 1891, Springfield had a general merchandise store, two grocery stores, two cigar stores, a drug store, two dress shops, two blacksmiths, a variety store, a meat market, a saloon, a barber shop, a shoe store, three hotels, two schools, and three churches. Also, in 1891, Springfield received its first railroad line. In 1910, Springfield welcomed the Portland, Eugene and Electric Railroad streetcar. 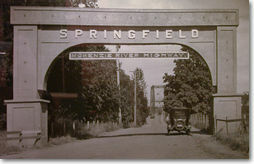 Springfield maintained its small town ways until after World War II. The retail center was still Main Street, industries were northwest of the railroad tracks and residences were to the north. In 1940, the City’s area was only 1.5 square miles and the population only 3,805. By 1998, apartments covered the spring. The City expanded to more than 13 square miles and the population grew to 51,700. 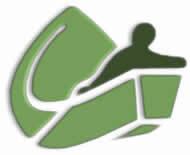 The City of Springfield adopted the McKenzie drift boat as the community’s official symbol on March 26, 1985 to commemorate the importance of this famous boat in the history of Springfield and the McKenzie River. Early versions of the boat, created by Veltie Pruitt and Prince Helfrich, floated the McKenzie River in the early 1900s. After years of changes to the craft, boat builder Woodie ‘Knoble’ Hindman developed the present design in 1946 on Main Street in Springfield. This well-known craft is used today around the world on streams and rivers requiring a sturdy agile boat to handle their perilous rapids. A detailed one-half scale model is on display in Springfield City Hall.